We’ve been doing some baking this week – made our Christmas cake, complete with wishes – and L was really interested in the scales we were using. In the past, although she’s always joined in, it’s been big sister who’s done most of the weighting, so it was interesting this time too see L looking closely at all those numbers and trying to weigh her own hand. 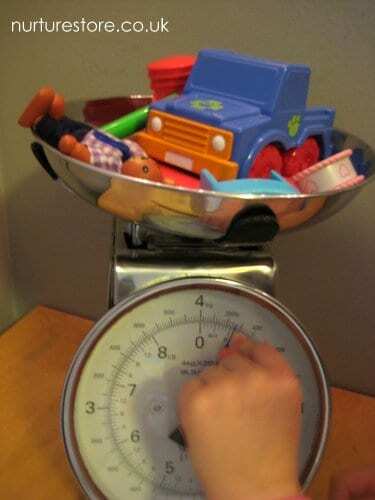 Time for an experiment to answer L’s repeated question: what does it weigh? 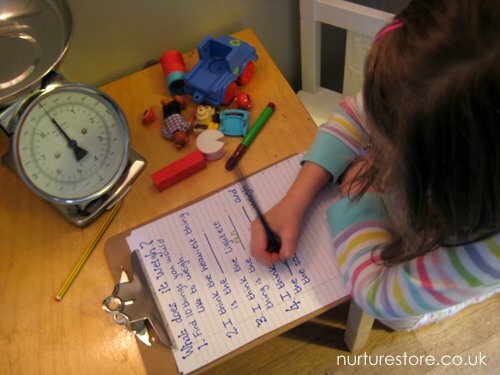 I moved our scales into the playroom and set out some question prompts to start L off. She does love a clipboard! 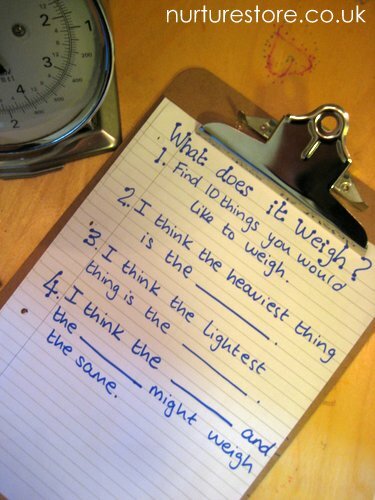 I let her pick what she wanted to weigh and included some suggestions to think about comparing heavy and light things. 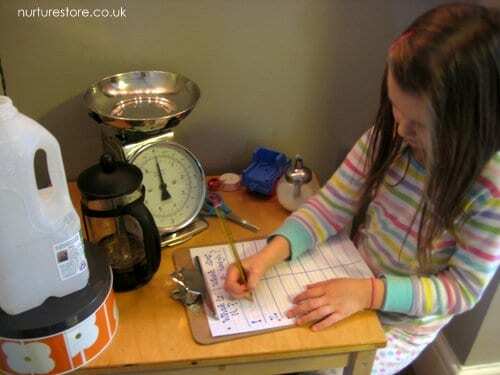 First of all she wanted to weigh everything at once and we spent a little time talking about the scales, why there are grammes and ounces, and how to read the numbers. 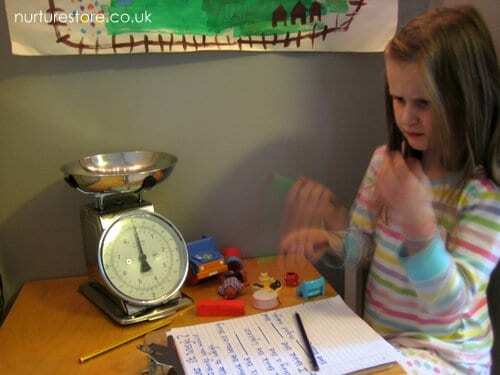 I encouraged her to think about the weight of the items before she put them on the scale. 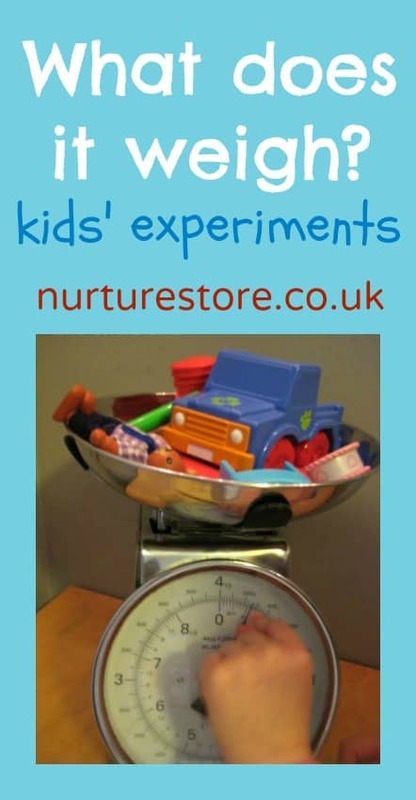 I think estimating is a great brain boosting exercise and encourages children to take a little risk and give their own opinion – everyone’s to be encouraged to have the confidence to try an answer and share their thoughts. Once my initial question prompts got her started, L was off – running to the kitchen to fetch more outrageous (she though) items! And asking her own questions: how can the tiny scissors weigh the same as the big milk carton? 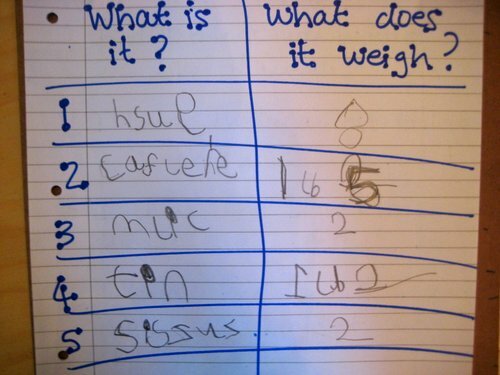 Once you’ve answered ‘what does it weigh?’ how about finding out how much water? 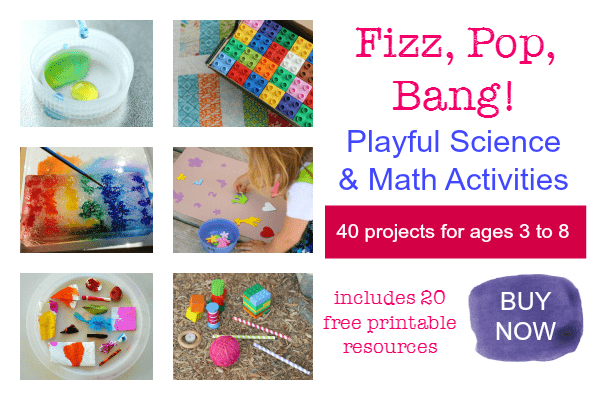 Add some Fizz, Pop, Bang to your learning! Take a look at our resources for creative science and math activities. What a great idea! I will try it out with my little ones for sure. Thanks for sharing!